0 Comment March 24, 2018 Like? So what is mimoLive? This little known live streaming and video production software is “multi-in and multi-out broadcast studio” that every Mac user should know about. It’s a “production truck studio without the truck” says CEO Oliver Breidenbach. “It’s the television studio without the studio” and Breidenbach could not be more spot on. mimoLive was apparently built specifically for mac (apple) users on the OSX platform to provide a powerful video production and live streaming experience that is natural to the apple user. In our presentation, Oliver goes on to explain that MimoLive is very popular in schools where students are putting on “student announcement” shows. Designed specifically for the Mac OSX operating system, Oliver has actually won an Apple design award for his work with MimoLive. In fact, Oliver shares with us a picture with Steve Wozniak when he won the award. This live streaming software is ideal for students and video production professionals alike used to using the Mac OSX software platform. MimoLive says that they built the software to be easy enough for a high school level student to use but powerful enough to high-end broadcasters. Above you can see the MimoLive interface which includes a very intuitive video production layout. Unlike other live streaming software companies that I have seen in the past such as Wirecast or vMix where the inputs are stacked below the live and preview video blocks, mimoLive is set up left to right. For a first time broadcasters mimoLive has a much lower learning curve than other platforms because everything the application is capable of is presented left to right in a single view. On the left hand side you can select your available sources. Next you can choose your layers. In a matter of minutes, I was able to put together a very dynamic live video production. I have used vMix and Wirecast for years and I have to say that mimoLive is easier to learn and faster to get started. The next area of mimoLive is the layer editing area. I also find this layout area very easy to understand. Instead of having a popup box or nested information area the layer detail area is always present. If you want you can pop it out or resize this area but for most video productions having easy access to your layer details is key. This area is where you can take control of your PTZOptics camera. 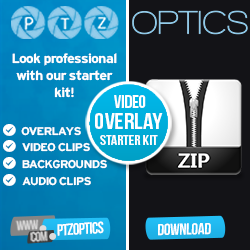 mimoLive was one of the earliest live streaming production software platforms to support PTZOptics camera support. The system has been in place for quite some time and allows a single broadcaster to control multiple PTZ cameras during his broadcast. The final area allows users to setup their multiple outputs which could include live RTMP streams to CDN (Content Delivery Networks) such as Facebook Live or YouTube. MimoLive has also added support for the NewTek NDI allowing users to ingest NDI video sources as inputs and also decide to output NDI. I found using the NewTek NDI on a Mac incredibly high quality. In fact, some of the NDI video sources on MimoLive looked even better than what I saw on our Windows-based vMix system! Livestream Studio builds in PTZ camera control support! Here’s our review.